News about the City of Muskegon, announcements and updates. Call 231-724-6705 with any questions. Under the Economic Vitality Incentive Program (EVIP) adopted by the state earlier this year, the City must meet certain criteria in order to continue receiving statutory revenue sharing funds. The first criterion was to prepare and make available a citizen’s guide and performance dashboard by October 1, 2011. The second criterion the city must meet is to certify to the Michigan Department of Treasury that by January 1, 2012 it has produced and made readily available to the public, a plan with one or more proposals to increase its existing level of cooperation, collaboration, and consolidation, either within the jurisdiction or with other jurisdictions. The City has adopted the attached EVIP Consolidation of Services Plan. The plan’s foundation is the Feasibility Study for Municipal Shared Services that was completed earlier this year under the auspices of a public-private consortium including the Muskegon Lakeshore Chamber of Commerce and the Cities of Muskegon, North Muskegon, Norton Shores, Roosevelt Park, Montague, Whitehall and Fruitport Charter Township. Each of these areas is discussed more fully in the attached plan. If you have comments or questions about the 2012 EVIP Consolidation of Services Plan, you can leave them below or email them to finance@shorelinecity.com. The City of Muskegon Comprehensive Annual Financial Report (CAFR) for the fiscal year ended June 30, 2011 is now available online. The CAFR summarizes the city’s financial activity for the year and includes the unqualified opinion of the City’s independent auditor – Brickley DeLong. The assets of the City of Muskegon exceeded its liabilities by $134,502,902 as of June 30, 2011. Of the total net assets, $21,809,807 (16.2%) was unrestricted and may be used to meet the City’s ongoing obligations to citizens and creditors. The City’s governmental funds reported combined ending fund balance of $10,926,340, a decrease of $1,185,458 (9.8%) from the prior year. The decrease is primarily attributable to a $1.0 million, one-time supplemental contribution made to the City’s defined benefit program to keep the program at a 100% actuarial funding level. You can view the FY11 CAFR by clicking here. You can view CAFR reports from prior years here. The City of Muskegon’s local government access channel has been moved from Channel 97 to Channel 96 as of June 28, 2011. The government channel allows citizens to view City Commission meetings live as well as several opportunities to watch a recorded version of the meeting throughout the week. In addition, the station offers informative shows about activities and programs offered within the community. Non-profits seeking exposure to their program/cause may call the City Clerk, Ann Marie Becker, at 231-724-6705 to see if their organization qualifies for a free show. The budget for the City of Muskegon’s 2011-12 fiscal year (7/1/11 – 6/30/12) is now available. The City’s financial situation remains very difficult, as it does for most Michigan government units. Property tax and income tax revenues have faltered due to the economic recession and housing market collapse. State-shared revenues are expected to be sharply reduced under Governor Snyder’s proposed state budget. At the same time costs for healthcare, pensions, fuel, and other critical items have risen sharply. Still, the proposed FY 2011-12 budget maintains critical services at their current levels. Although a handful of positions are proposed to be eliminated, most of these are currently vacant. We also expect several retirements to occur during the year which will afford an opportunity to restructure service delivery models in the most cost-efficient manner possible. The complete budget is available for review by clicking on the nearby image. The budget will be discussed in detail at the City Commission work-session to be held Monday, hearing on Monday June 13, 2011 at 5:30 PM. A public hearing of the budget will be held the following evening at the regular City commission meeting (Tuesday, June 14, 2011 also at 5:30 PM). Under City ordinance, final adoption of the FY 2011-12 budget must occur no later than the second regularly scheduled June meeting (Tuesday, June 28, 2011, 5:30PM). All meetings will be held in the 1st floor City Commission Chamber of City Hall. City Hall is located at 933 Terrace Street. If you have questions concerning the budget, you can post them in a comment below or email them to: finance @ postman.org (leave spaces out). If you are buying your annual boat launch permit, please consider a donation to the William G. Jackson Muskegon Lake Research Fund. This Fund, managed by the Community Foundation for Muskegon County, supports the work of Grand Valley State University’s Annis Water Resource Institute (AWRI) in monitoring Muskegon Lake. Decades of industrial use along the shoreline, years before state and federal clean water laws went on the books, have left a legacy of environmental damage. Some of this degradation is well documented and has led to Muskegon Lake being listed as an Area of Concern (AOC) by the U.S. Environmental Protection Agency. Muskegon Lake is one of 42 AOC’s within the Great Lakes. Grand Valley’s AWRI is committed to documenting the lake’s health, both today and into the future. Your donation to the William G. Jackson Muskegon Lake Research Fund will help to support this important work in making Muskegon Lake healthier for everyone’s lifelong benefit and enjoyment. If you have questions about the William G. Jackson Muskegon Lake Research Fund, contact the Community Foundation for Muskegon County at (231) 722-4538. When GM declared bankruptcy, pundits remarked that it had become a pension benefit company that made cars on the side. Unfortunately, very similar dynamics are at work in state and local governments around the country. The lingering effects of the 2008 investment losses, coupled with lower tax revenues and changing demographics (like people living longer than expected) are causing pension and retiree healthcare costs to consume an ever-increasing slice of city budgets. The Detroit Free Press recently ran an article on the subject of Michigan municipal pensions. 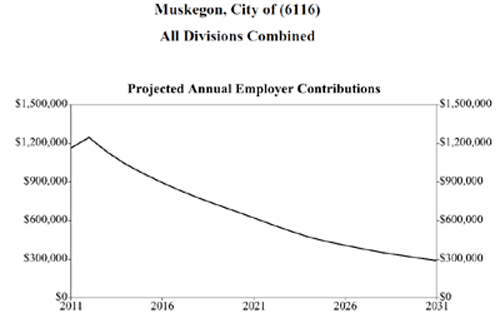 It is important for Muskegon City taxpayers to know that: 1) Muskegon is not immune to these pressures and, 2) specific steps have been taken to prevent pension and retiree healthcare costs from overwhelming the City’s budget. Move to MERS – Administration of the City’s pension programs was moved to the statewide Municipal Employees Retirement System (MERS) starting in 2005. This move has saved the City money while at the same time improving the level of services provided to employees and retirees of the City. Defined Contribution Retirement for New Employees – Defined benefit (DB) pensions, which provide a guaranteed pension for life, have been the staple in government for many years. However, the risk and liabilities for financing DB pensions rest solely with the City. Particularly with the recent financial collapse, many experts consider DB pension plans to be unsustainable for the future. The City has closed its existing DB plans to new members and, since 2006, new employees are members of a defined contribution (DC) retirement plan. DC plans are similar to 401(k) plans that are the predominant type of retirement program for private firms. Full Funding of Pension Costs – Each year an actuarial valuation of the City’s DB pensions is performed. The City has always followed a policy fully funding the actuary’s cost recommendation for keeping the pension funds in sound financial condition. The charts are based on data from the system-wide MERS 12/31/09 actuarial valuation. They illustrate that City’s pension funding policy has helped keep these programs financially sound. Summary: The City has well funded defined benefit pensions yet has made the decision to exit from the defined benefit pension business. Defined benefit retirement systems entail long-term risks and liabilities that the City does not want to have encumber its future. New employees are enrolled in a defined contribution plan that doesn’t entail long term liabilities for taxpayers. However, the process will take several decades to complete. The City has kept its pension programs well-funded and must continue to do so in the future until all pension obligations are met. Phasing out of the defined benefit pension business will take many years. This graph from the 12/31/09 actuarial valuation shows how the City’s annually required DB pension contributions are projected to decline over time. In addition to retirement pensions, many states and cities (including Muskegon) have made promises to provide health care benefits to retirees. Typically these promises were made at a time when healthcare costs were moderate and extending coverage to retirees did not appear too costly. Today, however, retiree healthcare has become a major liability and budget burden. Like escalating pension costs, retiree healthcare costs threaten to crowd out expenditures for police, fire and other essential public services. Most governments do not set aside funds to pay for future retiree healthcare liabilities as they do for pensions. Instead, they fund these costs on a “pay-as-you-go” basis out of the annual operating budget. 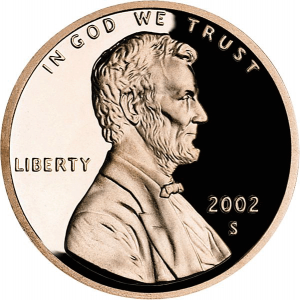 Pay-as-you-go funding means that investment earnings do not accrue to help pay future costs. Instead, actual benefit payments consume an ever-growing portion of the budget as the number of retirees grows and healthcare costs escalate. Scaled-back Benefits – Recognizing the unsustainable high cost of providing healthcare benefits in retirement, the City and its employee groups have agreed to significantly reduce these benefits for future retirees. Most recently, police and fire employees have agreed that future retirees will no longer receive a prescription card benefit. Other changes have included higher co-pays, required use of generic prescriptions, and required use of prescription mail-order programs. Transitioning to Health Care Savings Accounts – The City has put into place tax-advantaged savings vehicles that enables employees to save for health care needs in retirement. Over time, the City intends to move away from guaranteeing medical benefits in retirement and, instead, provide tools and incentives to help employees save for this purpose. Some employee groups have already agreed to replace guaranteed retiree healthcare benefits for new hires. Summary: Unlike most state and local governments, Muskegon has advance funded its retiree health care obligations for more than 20 years. Still, the City faces a large future liability (about $15 million) to fully meet its commitments. In addition to paying the full actuarially-determined cost each year, the City is actively pursuing reductions/eliminations of benefits for future retirees. This helps lower the outstanding liability. 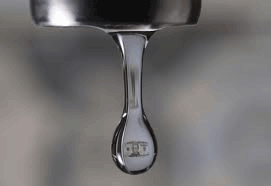 If you live in Muskegon, your cost for water and sewer is lower than in most areas of the US. 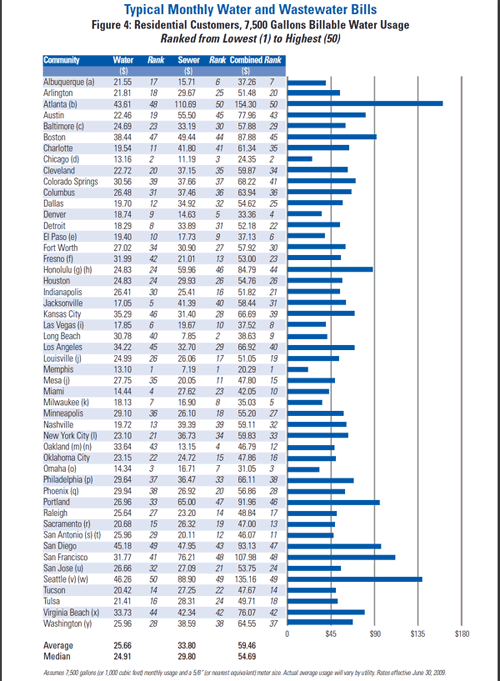 Recently, the national engineering firm Black & Veatch published a study of water and sewer rates in the 50 largest US cities. The study provides an up-to-date nationwide perspective on how much citizens around the country pay for water and sewer service. The study also helps puts into perspective how relatively inexpensive these services are in Muskegon. The cost for water in Muskegon is only slightly higher than the lowest cost city (Memphis, TN) in the Black & Veatch study. Muskegon’s sewer costs are comparatively higher, but still well below the mean and median costs for the surveyed cities. The first table below shows Muskegon’s water and sewer costs for typical residential customers compared with the cities in the Black & Veatch study. The second table is taken directly from the Black & Veatch report and shows the specific cities included in the survey and how they compare for residences using 7500 gallons of water per month. Commodity Price Increases. Particularly in the areas of electricity, chemicals, natural gas, and fuel. Inflationary pressure on natural gas and fuel has abated somewhat in 2010 but remains volatile. Lower Consumption and High Fixed Cost. In general usage is declining while many utility costs such as debt service are fixed. Since most pricing structures include volume-based charges, revenues are declining while costs are not. Benefits. Pension obligations and health care benefits are prompting an increase in labor costs. Influence of Wastewater Consent Decrees. Significant capital programs are being implemented in most major cities to comply with consent decrees regarding the performance of wastewater systems. Aging Infrastructure. Rehabilitation and replacement of aging infrastructure remains a significant liability for most water and sewer utilities. Funding this liability will undoubtedly create additional inflationary pressure for the foreseeable future. Why Are Payments for City Water Bills and Taxes Sent to Chicago? These are fair questions that deserve a thorough response. Like many utilities and other organizations that receive standard, recurring payments through the mail, the City of Muskegon utilizes a service through its bank called lock-box remittance processing. Using a lock-box for City payments greatly increases efficiency. Unfortunately, choices are limited when it comes to cities where lock-box processing centers are located. 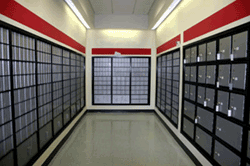 With lock-box processing, payments are sent to a special PO Box that is used only for receiving payments. Bank personnel are authorized to remove mail from the lock-box several times a day. The bank then processes and deposits the payments directly to the City’s bank account on the same day. Each day the City receives from the bank digital files including customer account numbers and amounts paid that are uploaded to our computer systems to update customer records. Additionally, the City receives electronic files with scanned images of the front and back of each customer’s check and payment stub. So why is the PO Box in Chicago and not in Muskegon? We chose Chicago since this is the Midwest’s major postal hub and would receive payments from Muskegon residents the fastest. What about keeping local jobs? The use of lock-box processing has not resulted in any lost jobs at the City. Lock-box processing automates several mundane, repetitive tasks like opening envelopes, scanning checks, and entering payment data. This work is performed more efficiently and with more accuracy than could ever be achieved with manual processing. Moreover, the City could not afford the investment in equipment that would be required to automate these tasks in-house. Lock-box processing has allowed us to focus our limited staff on more important and productive matters. The lock-box system gets the City’s funds securely deposited and earning interest more quickly. Since payments go directly to the bank, there is less handling of the mail and less chance for payments to be lost or stolen in transit. PaulT https://www.muskegon-mi.gov/cresources/logo1-300x36.png PaulT2010-07-07 07:15:072016-10-12 13:56:17Why Are Payments for City Water Bills and Taxes Sent to Chicago?